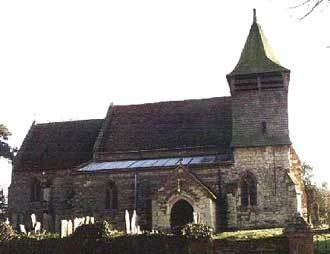 The parish church of Hoggeston is dedicated to the Holy Cross. The church has a 16th century weatherboarded bell turret (containing 3 Change ringing Bells and a Sanctus bell) over the north aisle. The origins of the church are 13th century. There are 14th century additions, and some perpendicular windows of the same era. The stained glass east window was designed by Sir Ninian Comper in 1949. The wrought iron gate, made in the 1970s, into the church yard depicts a stag, the crest of the Micklem family, who resided at Maines Hill, a house just outside the confines of the village.